He did not understand this fey power of hers to make people like her. 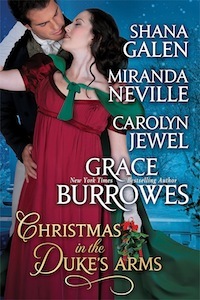 Ny novella In The Duke’s Arms is available individually.
. NOTE: As of January 31, 2018, the anthology will be taken off sale. There are no current plans to reissue the anthology. Sir Leviticus Sparrow is a man of business who means business when it comes to offering Penelope Carrington marriage under the mistletoe. With her year of mourning at an end, Penelope Carrington must remarry in haste, or her portion of her late husband’s estate won’t be enough to dower her younger sisters. Shy, handsome man of business Sir Leviticus Sparrow longs to give Penelope a marriage proposal for Christmas—and his heart—but Sir Levi must first foil the other bachelors scheming to meet Penelope under the mistletoe in his place. What’s a Duke to do when he’s made an awful impression on the love of his life? The Duke of Oxthorpe lost his intensely guarded heart to Miss Edith Clay when Edith’s rich cousin sought to attach the duke’s marital interest. So smitten is Oxthorpe with the former poor relation that he’s gone through intermediaries to sell Edith a property adjoining the ducal seat. Edith doesn’t much care for the haughty duke, but as Christmas approaches, Oxthorpe reveals himself to be reserved rather than arrogant, considerate, and—blame the mistletoe!—an accomplished kisser. Will Edith hold Oxthorpe’s earlier behavior against him, or will she learn that the best holiday gifts can be the most unexpected? If Lord Carbury could learn to take no for an answer, his marriage proposal might earn him a yes. Wyatt, Viscount Carbury is much too busy to court a bride, but when his childhood neighbor, Robina Weston, is left orphaned and penniless, Wyatt dutifully adds marrying Robina to his list of responsibilities. Wyatt is dismayed to learn that for Robina, poverty and pride are preferable to sharing life with an arrogant, infuriating man who always thinks he knows best. When Wyatt and Robina must endure Christmas in the country together, antipathy turns to interest, and then to unexpected attraction. Will they fight their feelings, or yield to the surprising gifts the holidays offer? Fledgling spies Q and Moneypence pursue love and a highwayman in The Duke’s Arms. When weapons designer Eliza Qwillen (Q) and Pierce Moneypence, clerk to the mysterious M, arrive in the English countryside, they’re unprepared for the dangers that await. The operatives are intent upon capturing the highwayman styling himself as the New Sherriff of Nottingham. Secret rendezvous, mistaken identities, and cat-and-mouse games challenge these fledgling agents, but rediscovering their passion for each other is the most rewarding mission of all. All rights to In The Duke’s Arms belong to me.